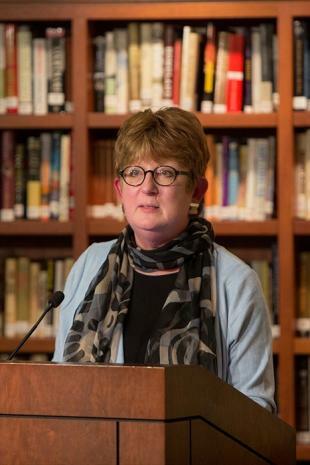 As AP Executive Editor Kathleen Carroll delivered the Joe Alex Morris Jr. Lecture at the Nieman Foundation for Journalism at Harvard Thursday night, she called for international news coverage that engages audiences one powerful story at a time. Iran. Iraq. Syria. Afghanistan. Lebanon. Libya. Bahrain. Yemen. Israel. Gaza. It’s too easy to think of these as places where only fighting happens. Fighting over religion. Over power. Over land. The three great roots of almost every conflict on the planet. Journalists covering these countries know better, of course. Those are rich, vibrant nations filled with people who have much in common with human beings around the globe. They want ordinary things. A home. Meaningful work that will put food on the table and allow them to care for their children. A quiet and peaceful life. Mundane. And yet, who will read a story about a quiet and peaceful life? Instead, we think audiences are more interested in the quest… the hope for a mundane life than in the living of one. And that is one of the thorny issues that we face. In each family’s saga there are stories. Good, human stories that our audiences crave. What is the lesson for journalism here? That big seismic events are hard to see, hard to grasp. Overwhelming. We need the intimacy of the individual story to help us make sense of it. We can’t absorb that 3,000 people or more have died trying to reach Europe in flimsy rubber boats that give way. Those are numbers, not people. But we can understand the agony of Huda Malak, pregnant with her first child in one of those flimsy overloaded dingys slowing sinking a mile from the Greek sanctuary of Lesbos. All the goods on board the boat have already been thrown overboard to no avail, when Malak’s husband, Tarek Sheikh stands up, saying “I’m doing this to save you, our child and everyone on board.” And then he jumps overboard. Malak’s boat makes it to shore and a desperate rescue effort returns Tarek to her, shuddering and soaked, but alive. That’s one of the stories that Patrick McDonnell of the LA Times told about the millions of people moving from countries in conflict seeking countries in peace. The Times stayed in touch and we learned months later that Malak and Tarek have settled in the central French city of Lyon. Are we invested in them, in their story? So, in this avalanche of information and images … in this cacophony of arguments about how the world should be … where is the place for journalism? What is our role? The mission is no different:to inform the world. I believe in that mission now more than ever. But how we go about it demands more of us as individual journalists. And it especially demands more of institutions that employ journalists, even though they are challenged economically like never before. What does that mean? You’ve heard this: It’s not enough to report on what happened. News consumers want to know why something happened. About what it means. And I’m not just talking about adding a couple of paragraphs of “context” that are actually quotes from an expert. No, we must offer genuine insight. The kind of that comes from experience with a subject, a place. The kind that Alissa Rubin and Kathy Gannon can bring to stories of Afghanistan, for example, because they have lived and worked there for years. We must continue to investigate the institutions of power just as we do in the United States. This work is increasingly dangerous. More dangerous that it has ever been. For expats and especially for local journalists, covering their home territories. Last year was the deadliest on record for journalists. This year, journalists are being jailed on trumped up charges in record numbers. Autocratic leaders demand fawning coverage and if they don’t get it, the price is prison. Not a very pretty picture, is it? The work is dangerous. The risks are high. The market is shrinking and the audiences subject to boredom and ennui. So, then is international coverage worth it? Of course it is. Now more than ever. Our lives are too interconnected to turn our backs on the world. And we know from history the dangers of the rest of the world turning inward, too. Journalism is what can make the difference. Journalism can help people understand each other. Can help make sense of the complexities. Can help us see the common humanity in all. We need journalism to help our fellow humans to resist walling themselves off from each other. We owe it ourselves to make sure we get this right. We owe it to our fellow global citizens to get this right. Because at the end of the day, everyone the world over wants one thing: The security of a quiet, peaceful … yes, even a mundane life. The full text of Carroll’s prepared remarks is available here.